Today is a solemn day. It is a day to pause and remember those who have given their lives in the cause of this nation; those who have paid the ultimate price for their dedication to duty and unfailing service to this homeland. For one minute on this Commemoration Day, we are asked to observe silence, a pause to honour their sacrifice. For the family and friends who died in the service of the UAE, there can be solace taken from knowing that their loved ones died doing their duty, upholding the cherished values of freedom, justice, honour and right, standing by their posts in defence of this union that binds us all in common purpose and common cause. Those who wear the uniforms of our Armed Forces do so with pride, knowing that they will be called upon to serve their homeland in testing situations and in restoring hope where there is darkness, faith where there is a void, and justice where there is an abyss. This homeland we all share has never shirked its responsibilities to those who live in lands stalked by political and social conflicts, troubled by tempests and the extremes of nature’s elements. This is a nation dedicated to helping others, lending a hand, taking to arms if necessary to protect and secure, defend and bring justice. And that means placing all those who serve this nation in the Armed Forces in situations, where duty is fraught but the reward of knowing that right and justice are allies in arms, is a salve. Not just today — but especially so — we should pause to remember those who have given their lives so we might endure: Sergeant Saeed Mohammad Al Hajeri; First Corporal Obaid Hamdan Saeed Al Abdouli; Warrant Officer Class 1 Ali Mohammad Rashid Al Hassani; Sergeant Khamis Abdullah Khamis Al Zeyoudi; Marine First Lieutenant Khalifa Saif Saeed Al Khatri; Sergeant Ali Khalifa Hashel Al Mesmari; First Corporal Abdullah Mohammad Ahmad Al Dahmani; Major Pilot Ali Saeed Saif Al Mesmari; and First Lieutenant Pilot Bader Yahiya Mohammad Al Marashdeh. These servicemen died performing their national duties this past year, and this nation, its leadership, government, citizens and everyone who call UAE home, is deeply honoured by their service. 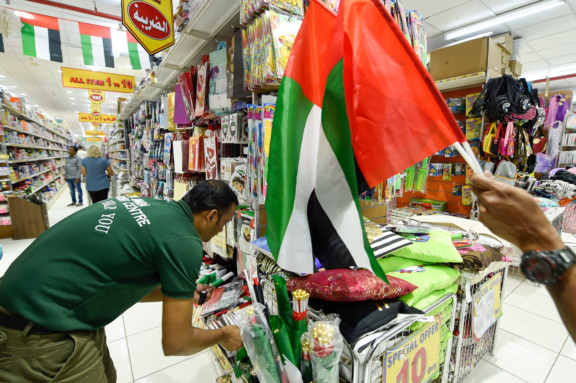 All who have given their lives in the service of this homeland will be remembered wherever the green, red white and black banner of the UAE flies. And they will be remembered, not just for one minute today, but at every setting of the sun.